What’s this? 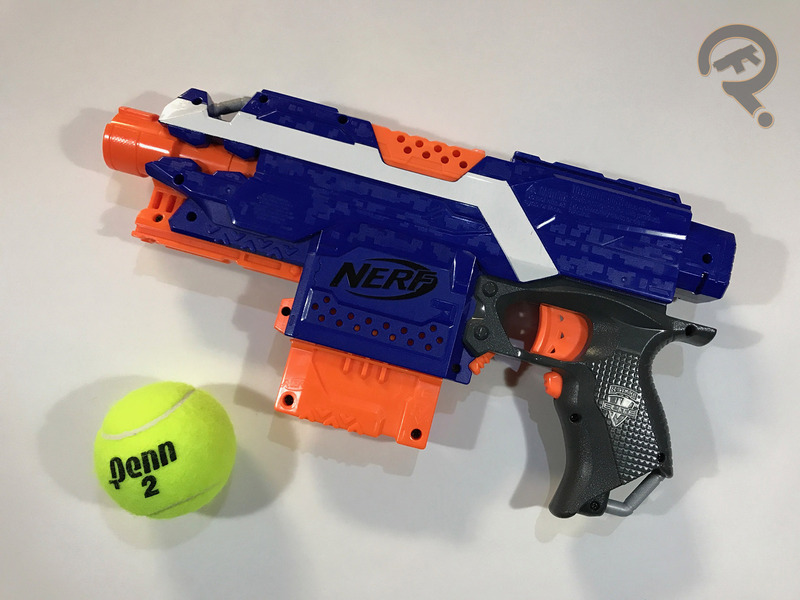 A review of an actually new blaster? Yes, we’re well into August and so that inevitably means getting hit by a wave of new Nerf blasters, many of which were seen at NY Toy Fair back in February. Today’s review is one of those blasters. It’s also an example of a spin-off of a spin-off, where at first we had N-Strike Elite, then Modulus, now we have Modulus Ghost Ops. Spooky. Let’s take a look at the blaster. 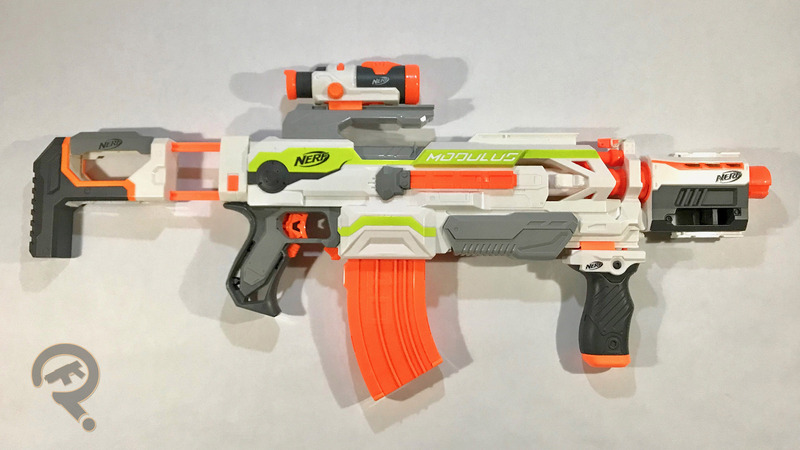 If you hadn’t yet read the title of this post, I am indeed reviewing the Modulus Ghost Ops Evader. It was released in 2018 as the first and, so far, only blaster in the Ghost Ops sub-series. Functionally, it’s a Stryfe just with a side-loading magazine, still using the same flywheel semi-auto mechanism. Hey, if it works, use it. The big draw for the Evader is the completely clear plastic the shell is cast in, and subsequently, the light-up feature that this allows. The main pistol grip contains all of the standard flywheel controls we’re used to, but the fore-grip also has a button which, when pressed, activates the green LEDs inside the body of the blaster, giving it an almost night-vision kind of look. That is, as long as it’s not too bright wherever you are. The effect definitely gets stronger in darker conditions, unsurprisingly. Assisting the LEDs is an array of light piping and refractive surfaces that give the light more places to bounce off so you can actually see it. It should be noted that the button for the lights has to be held down to keep the lights on. I had to jerry-rig my blaster to keep it lit for one of the photos without my hands getting in the way, so don’t expect that to be the norm. The lights are overall pretty well incorporated into the blaster’s design, and I especially like the lights inside the muzzle that are only activated when you attach the included barrel extension. The shell appears to be well made, but it’s hard to see what the shape of it really is the way you could with an opaque blaster. When I first took it out of the box, it was a lot bigger than I expected but that turned out to be ok since it addressed my concern that the thumbhole fore-grip might be small and awkward. It’s still not conventional but even with my larger hands, I can say it’s perfectly functional. 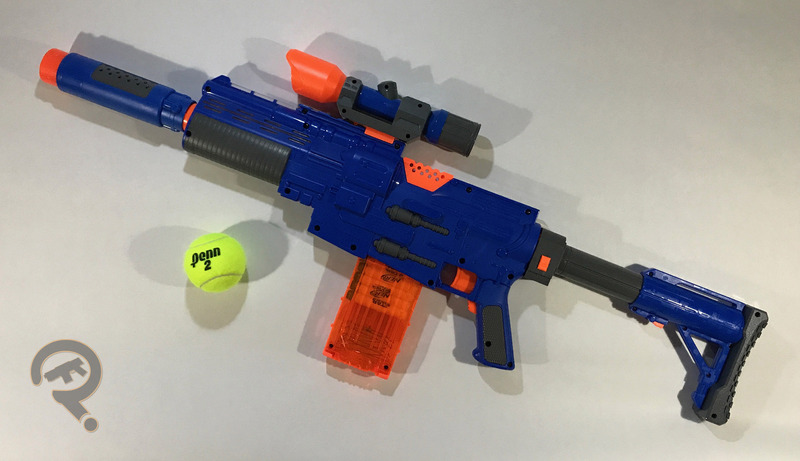 Being a Modulus blaster, the Evader sports a top, bottom and side rail (right side only), as well as attachment points for a stock and a barrel. I’ve only used the Evader with the batteries that came installed from the store, but even as such, it seems like it has a decent amount of power behind it. Shots travel far and hit hard. It’s already been proven to be effective in combat in my ongoing campaign against the spider crickets in my basement. I expect it would perform just as admirably against younger siblings, especially if you use the light-up feature as some sort of psychological/intimidation tactic in conjunction with the actual darts. 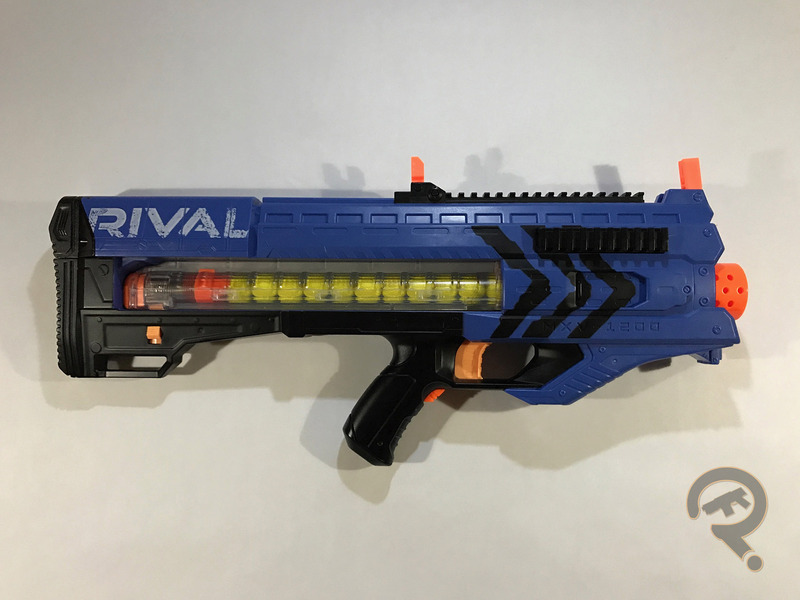 The Evader comes packaged with the barrel extension, 12 white Modulus Elite darts, a 12 round magazine, and the 4 AA batteries that power both the lights and flywheels already installed. The Evader was the first of the new 2018 wave of blasters that I purchased, but not the first I attempted to buy. A few weeks earlier, I had found the Delta Trooper on shelves at my local Target, but when I went to go check out, I was told they couldn’t sell it to me so I had to leave without it. When I eventually went back, I found that they had just recently put out the new blasters with the one exception being the Delta Trooper. It doesn’t really have much to do with the Evader itself but its a bit of a story. You know what this page needs? It needs more balls. Like, just a little pile over there, like 2 cubic tons. Ok, maybe not that many, more like just a few ounces. And obviously, I’m talking about the Nerf Rival High-Impact Rounds. What else could it be, you weirdo. Yes, it’s another Rival review, and this time we’re looking at part 2 of the line’s debut release, named for the king of the gods himself, the Zeus MXV-1200. Let’s check it out. Here’s a fun fact, the names of the Rival blasters are actually quite informative. Let me break it down for you. So far they all are named for a deity from the ancient Greek pantheon and that’s just to sound cool. After that, if the first letter is an M, that stands for “motorized.” If there’s no M, you can assume it’s spring powered. The next letters are the Roman numerals for the last 2 digits of the blaster’s release year. XV is 15, hence, the Zeus and Apollo came out in 2015. Lastly, the number after the hyphen is the blaster’s initial magazine capacity multiplied by 100. All clear? Good, let’s move on. 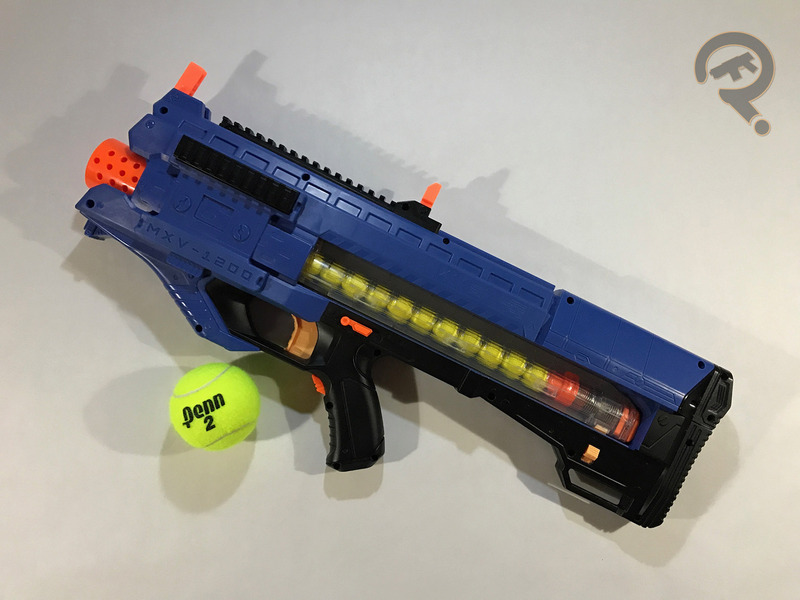 As the name suggests, the Zeus is a semi-automatic flywheel powered blaster with a 12 round capacity using the included magazine. The flywheel mechanism itself is nothing new, though it has been substantially beefed up to deliver the expected Rival performance. The shell of the Zeus is completely original and features a unique in-line side loaded orientation for the magazine, using the magazine spring itself to feed rounds into the flywheels rather than some other pusher mechanism. Exchanging magazines is a little tricky at first because of how unconventional the layout is, but with a little time you get used to it. Something worth noting is that the Rival 12 round magazines are the only ones that will work with the Zeus. The Zeus’s handling is pretty good, though I do have some minor gripes. The blaster feels solid and rather hefty in the hand, but the housing for the motors sticks out kind of abruptly from the left side and can dig into your palm if you’re not holding it just right. Also, the pistol grip feels a little slim and I might have preferred just a bit more there to hold onto. There is a lever safety above the trigger that prevents the rev switch from being pressed when it’s engaged, but it’s got a lot of play before it actually clicks into place and feels like it was probably a last minute addition. 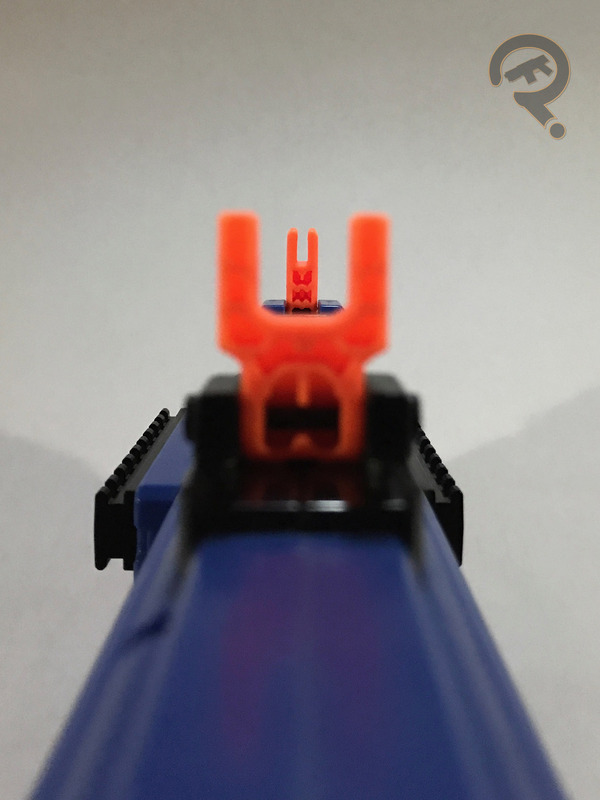 The Zeus sports 3 Rival attachment rails (not the standard Nerf rail, these are specific to Rival), one on each side and a longer one along the top of the blaster. It also has flip-up sights to help with aiming but they sit a little low compared to the back end of the blaster so you have to really mash your face into the cheek rest to get a decent sight picture. Functionally, the only complaint I have is that I wish inserting a magazine didn’t automatically make it push a round into the blaster. Again, these are minor issues that I have and don’t affect my overall opinion of the blaster that much. That’s because actually shooting the Zeus is a joy. 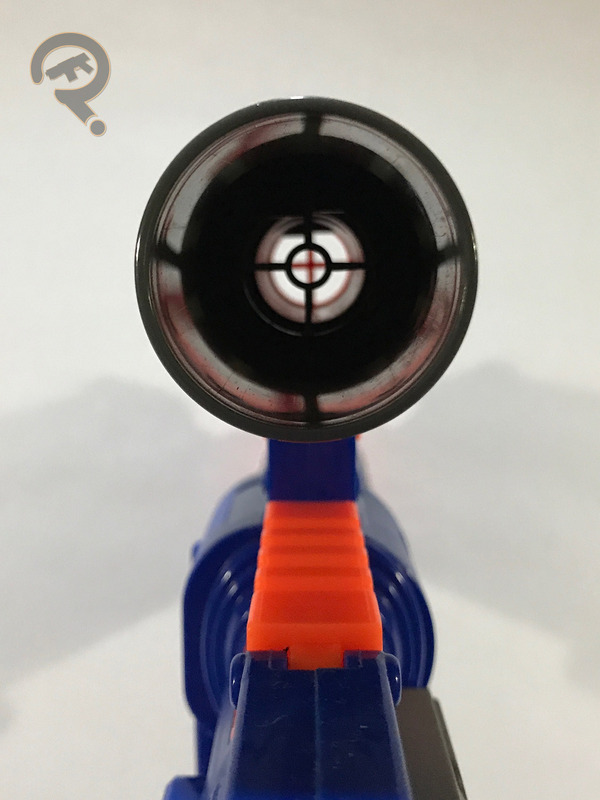 Unlike other flywheel dart blasters, the Zeus revs up with a sound I’ve often described as a bag of angry hornets, and that sound is very much understandable once you pull the trigger a few times. It launches rounds on more or less a straight line trajectory for a good 50 feet before they exhibit any noticeable drop. Rounds also hit hard, making indoor shooting kind of a bad idea if you don’t want to risk breaking anything. The plus side of this is that usually, you don’t even need to shoot anything to freak out your sibling when you bust into their room. Just rev the darn thing like a mother-something chainsaw (what?) and that’ll get your point across. The Zeus MXV-1200 requires 6 C batteries and comes packaged with 12 High-Impact Rounds and a 12 round magazine. The Zeus isn’t perfect. Almost no blasters out there are, but it’s easily in the top 10% and very much a force to be reckoned with. It sounds like thunder when it revs up, buzzy, high pitched thunder. It hits like lightning. There might be some hyperbole in there but you get the point. It seems “Zeus” is an appropriate name for this blaster. It’s not much of a womanizer though, so I guess that’s probably a point in it’s favor. The Captain Cassian Andor Deluxe Quite A Mouthful Blaster was released in 2016 as a tie-in product for Rogue One: A Star Wars Story. This specific blaster is the Target exclusive blue recolor of the Jyn Erso Blaster from the same line. Plus, this one’s got a bunch of accessories that Jin’s blaster doesn’t. It’s built on the classic magazine-fed flywheel system we’ve seen on the Stryfe and other blasters. Holding down the rev trigger spins up the flywheels and pulling the main trigger pushes a single dart into the wheels, sending it flying. The big difference between the CCADB and the Stryfe is the inclusion of lights and sounds which activate on the trigger pull, regardless of the rev trigger being pressed. I was actually pretty impressed with the lights on this blaster. Every time the trigger is pulled, a series of green LEDs in the barrel light up in rapid succession giving the illusion of a laser blast traveling down the barrel. Accompanied by the sound effects, it really does make just pulling the trigger quite satisfying. It’s also worth noting that holding down the rev trigger turns on the blue LED in the chamber as part of the blaster’s Glowstrike feature. 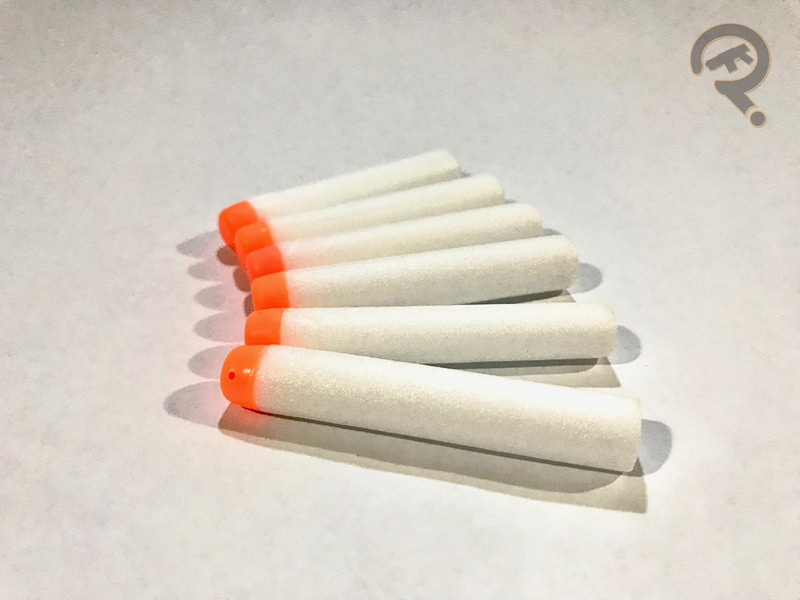 The included magazine holds 12 darts and, unlike most standard N-Strike Elite magazines, is completely transparent orange on both sides. The outer shell of the base blaster is completely new work though shared with the Jyn Erso blaster, and looks a good bit like the blaster in the film which, if anyone cares, was made with an AR-15 as the base of the prop. Like with the Poe Dameron blaster, the use of real-world firearms parts makes holding the blaster fairly comfortable, though there is some noticeable down-scaling from the real thing, making it a little cramped in the grip. All the included accessories with the CCADB are recolored attachments from various other blasters. The stock comes from the N-Strike Raider CS-35, the scope comes from the Modulus Long Range Upgrade Kit, the barrel extension/suppressor comes from the N-Strike/Elite Specter REV-5, and the bumps along the sides of the magazine indicate it comes from the Modulus Flip-Clip Upgrade Kit. 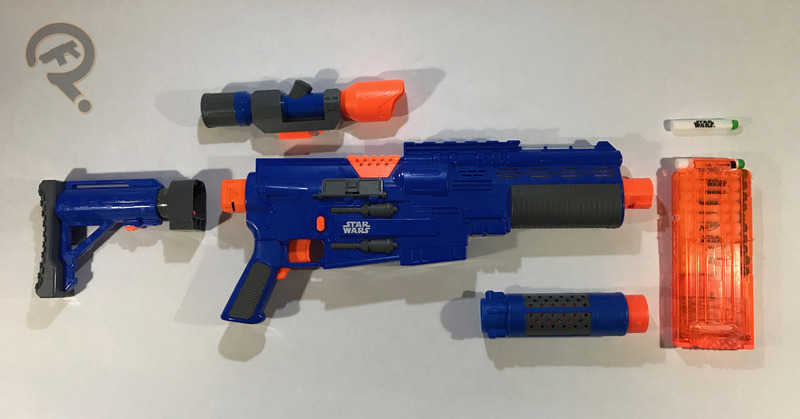 In addition to the grip being a hair small, some sections of the blaster feel a little flimsier than I’m used to from Nerf. It’s not a lot, but the grey panels on the sides of the grip and the battery tray cover do flex a good bit if you have a firm grasp on the blaster. This CCADB is not a heavy hitter in terms of performance. The power of the flywheels is rather limited, either by design or because the batteries also have to power the lights, sounds, and Glowstrike feature when firing. This is an indoor blaster, no question. It does fire reliably but shots arc more severely than most other blasters and don’t land with as much force, making it ideal for busting into your sibling’s room and emptying the mag without fear of getting in as much trouble. The CCADB comes packaged with 12 Glowstrike Star Wars darts, a 12 round magazine, a scope, a stock, a barrel extension, and 4 AA batteries already installed. This blaster is largely what convinced me that the addition of lights and sounds to the Star Wars Nerf lineup wasn’t necessarily a bad thing. While the Death Trooper blaster is fine, the effects on this blaster are pretty top notch and, having seen this year’s offerings, set the standard for effects for “deluxe” blasters to follow. 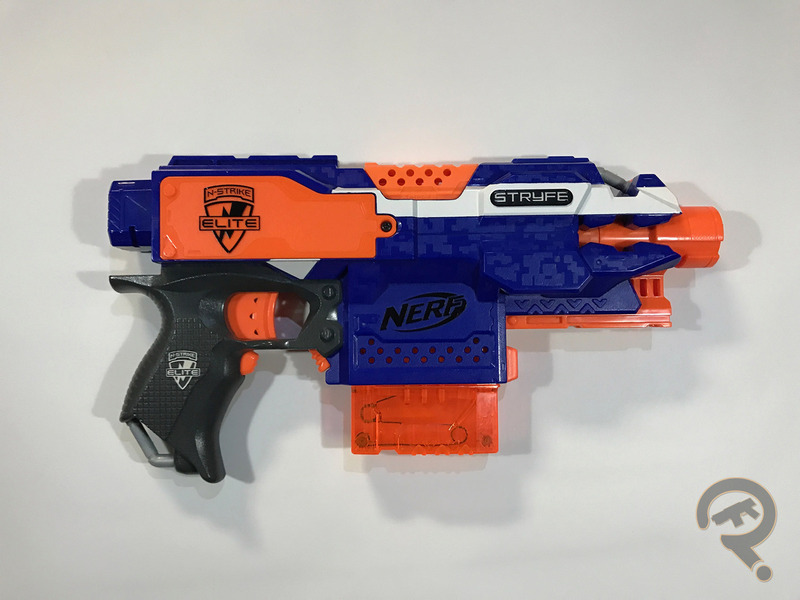 If you’re a regular Nerf-er, you probably looked at the title of this weeks review and thought “what could this chuckle-head possibly have to say about the Stryfe that hasn’t already been said?” The answer is this: the Stryfe is vanilla ice cream. Feel free to quote me on that. Lost? That’s ok. Stick around and I’ll explain it to you. The Stryfe was released in 2013 as part of the N-Strike Elite series, which is Nerf’s core product line. It is an electronic, semi-automatic, magazine-fed, flywheel blaster, much like the Rayven before it. Really the only functional difference between the Stryfe and the Rayven is the position of the magazine. Now, allow me to explain the vanilla ice cream. The Stryfe is really nothing new (especially at time of writing this). It doesn’t offer any huge breakthroughs in dart blaster tech. Out of the box, it’s not a game-changer by any stretch of the imagination. In this sense, it’s kind of plain, vanilla, if you will. Now, this is not to say it’s bad either. Vanilla is still a tasty flavor, and as such, the Stryfe is a perfectly fine blaster. The grip is comfortable in-hand, magazines can be changed out quickly and easily and it only takes a couple seconds to rev up before firing. Once revved up, darts fly pretty well and hit with some considerable force, just so long as it has fresh batteries. Simple and mostly functional, but it doesn’t stand out in any real way, in fact, without some light modification, there’s a mechanical lock that prevents the trigger from being pulled if there isn’t a dart loaded and this lock doesn’t always work correctly. The result can be a fully loaded blaster that refuses to fire, but this starts to get into where the Stryfe really shines. I would say, tasty as it is, relatively few people eat vanilla ice cream entirely on its own. This applies to the Stryfe as well. While the blaster is serviceable out-of-the-box, the potential for modification is monumental and allows just about anyone to get in on it. 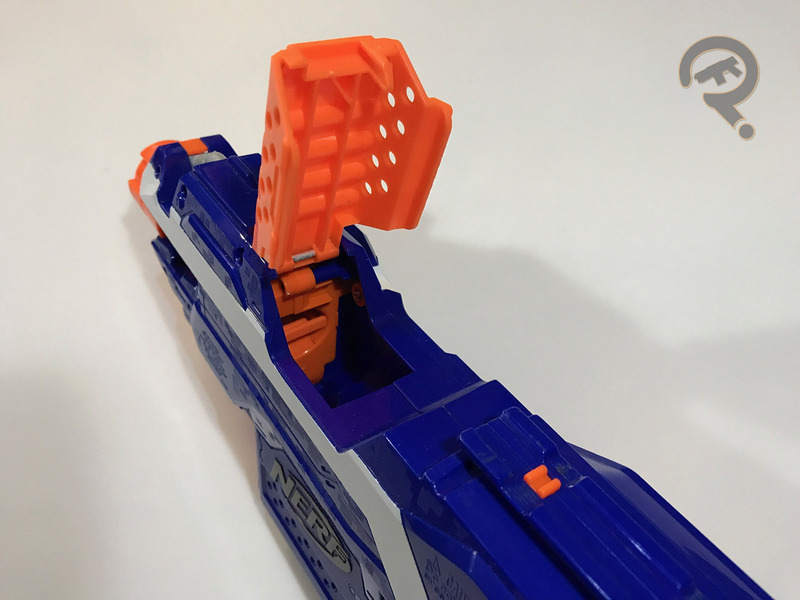 The Stryfe features one attachment rail on the top of the blaster and one on the underside of the barrel. Additionally, the muzzle sports a barrel attachment lug, and there’s a connector to attach a stock as well. 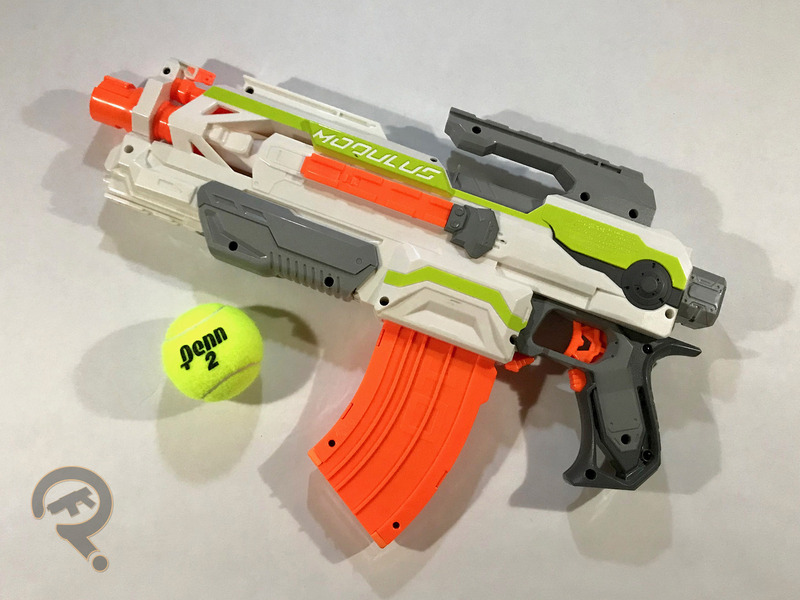 When it was released, there were a handful or so attachments that could be fitted to the Stryfe and that number has increased many fold thanks, in no small part, to the launch of the Modulus line. Throw some sprinkles on that ice cream. Of course, these are all external modifications only and don’t really add to the basic performance of the Stryfe, but what if you’re looking for a more serious upgrade? If you fancy yourself handy with a soldering iron, there’s no shortage of tutorials out there on how to rewire a Stryfe to increase voltage, swap out switches, use rechargeable LiPo batteries and so on. Now you’re looking at a decent little sundae with hot fudge or whipped cream or whatever, but there’s even more than that. 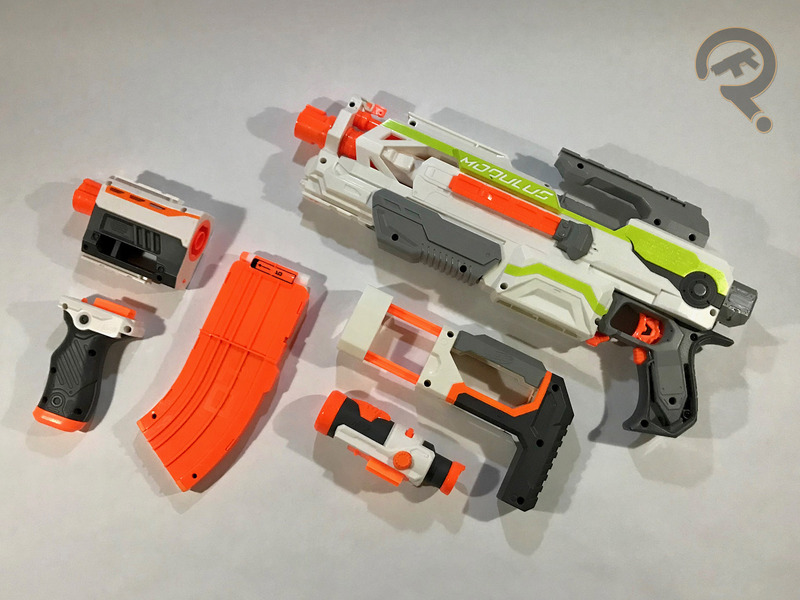 Thanks to companies like Worker and a slew of others, there is a growing market for 3rd party modification kits, many of which are geared specifically for the Stryfe and they can get pretty in depth. If you’re looking to dress a Stryfe up like real-steel firearm or replace the flywheels to rifle the darts as you fire them, there are kits for just about anything. Now you’ve gone and stuck a brownie in with the ice cream. A regular, unmodified Stryfe requires 4 AA batteries and comes packaged with a 6-round magazine and 6 Elite darts. After all that talking-up of the potential modification options for the Stryfe, it may be a little surprising to know that I’ve only ever modified them to the point of removing that irritating lock. Maybe if I had more free time and money to spend on kits, I might have gotten more involved, but given the assortment of stuff available, I think it is more a question of when I get into more serious mods rather that if. And for the record, I totally eat vanilla by itself.